Welcome to Krui Surf Camp! Hotel Mutiara Alam Zandino has more than 20 years experience hosting visitors to the West Coast of Lampung. From our early days in the late 90s up to the present we have helped thousands of visitors discover the Best of the Wild, Wild West; from the white sand beaches and epic waves along the coast to jungle treks and waterfall tours, we know our way around the area like no one else. We are a family run business and we live here year round and always maintain strong ties with the communities up and down the coast. You will be a part of our family and we will help you get the waves you are after and help you explore the inland attractions, in comfort and safety. OUR BUSINESS IS YOUR PLEASURE! For the 2018 season we are offering 6 brand new double fan-cooled rooms with en suite western bathrooms a cozy terrace to relax on, a treehouse lookout over the sea, and as always, lots of great healthy food and there’s always a cold Bintang or Soda waiting. We are strategically located 3 kilometers south of Krui and have 3 waves right out front: Slingshots, The Peak, and LeftOvers aka “the Glory Hole.” We are 1 km from the Krui Keyhole and Krui Left and another half km down the beach is Krui Right. We are an equal distance from the bigger rights and lefts to the north and south and our experience with the wave condition will help guide you in the right direction regardless of swell, wind, and tide conditions. We offer round trip airport transfers to and from Bandar Lampung Airport (Airport code TKG). All our cars are air conditioned and we always use trusted drivers who know the roads, and the best places to stop for scenic photos, a bathroom break and quick healthy meal. We also provide an onboard ice chest full of cold Beer and soda so you can enjoy the 6 hour ride in comfort, safety, and style. Once you are at home in Krui we provide motorcycle rental for the adventurous or we can hook you up with a daily rental car to take you to any of the waves up or down the coast. Our drivers know the roads and the waves, and will make sure you and all your gear are safe and sound, and that there are plenty of cold drinks waiting for you in a shady spot on the beach. Your host and our local surf guides are always stoked to spend time shooting photos and video, and will often join you on the day trips. 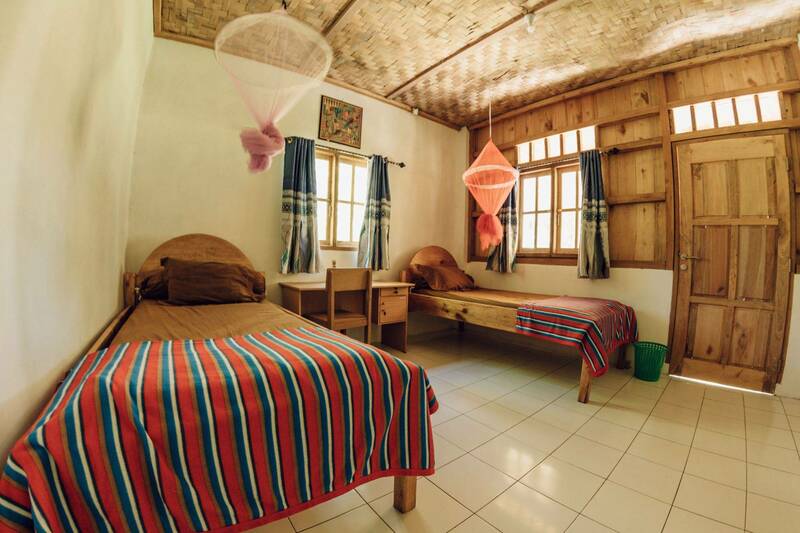 We have 6 brand new fan-cooled rooms with 2 extra wide single beds and a mosquito net; a board rack and clothes hanger, shelves and a desk provide plenty of space to stash your gear. All the new rooms offer western-style private bathrooms. The house rooms are homestay style with several shared bathrooms and many of our repeat customer insist on staying close to where the action is On our wooden framed terrace where all meals are shared and many a late night has been spent. We have several outdoor showers for a quick rinse after a surf or a hot ride. We always think of your comfort and try our best to offer you what you need before you have to ask. Our treehouse perched above the tideline serves as an observation platform, looking out on the waves, and is a favorite for chilling out, reading, tking photos, and yoga practice. Our 24 hour security crew will always be around to look after your boards and bikes, and any stuff left out overnight will be put safely into the house, or the board bunker in our garage. All guest are always welcome to enjoy the classic Sumatran architecture, natural history artifacts, traditional handicrafts and lending Library inside the main house. We can also provide an extra bed for any guests wishing to share with a friend. 3 fresh healthy meals are provided daily: breakfast, lunch and dinner are all included in the package price as well as unlimited drinking water, coffee and tea. An ice chest is always right where you need it there on the porch, and our “honor roll” is posted on the wall for your convenience. All our meals are ALL YOU CAN EAT BUFFET STYLE. Lunch and dinner always consist of a variety of protein sources, fish, octopus and other seafood are the mainstay, always the Freshest catch of the day. we serve lots of crisp tempeh and tofu, and every meal includes a surplus of fresh cooked veggies, raw veggies and salad, and there is always some proper homemade chili sauce on the table to dazzle your tastebuds. We also offer some crunchy munchies during “happy hour” as an appetizer. We are more than happy to provide suitable fare for any vegetarian or vegan guests and provide special menus upon request. just let us know what YOU want and we will make sure you get your fill.